The World Food Program is airlifting 36 metric tons of life-saving food to 18,000 people in Zemio, Central African Republic. The WFP reports Zemio, a region 1,000 kilometers east of the capital Bangui, is unreachable by road because of insecurity and transport difficulties. This is the first time in a year that the U.N. World Food Program has launched an airlift of this scale in the Central African Republic. The WFP says the worsening security situation and impossibility of bringing food supplies into Zumio by road has created a food and nutritional crisis in the region. The operation involves eight airlift rotations. WFP has completed six of them. The remaining food supplies are being airlifted to families in Zemio on Wednesday. WFP spokesman Herve Verhoosel said the arrival of food by air is coming at a crucial time for thousands of displaced people who are unable to move around freely because of increased violence. He told VOA that WFP will re-evaluate the situation in Zemio in the coming weeks to see whether airlifts should resume. "Because of the military and the security situation, most of the people are IDPs, are displaced in IDP camps. They have no access to the markets. They have no access either to the field to cultivate. As a result of that, the malnutrition, including for children is important there. But, also in the country," he said. The United Nations reports nearly half of C.A.R. 's population of 4.7 million is short of food. A recent national nutritional survey shows more than seven percent of children aged six to 59 months are suffering from acute malnutrition. Verhoosel said the WFP will continue to scale up emergency aid for vulnerable people in the country. But he said the agency's operation is costly, especially when airlifts are factored in. He said far less than half of the agency's $145 million appeal for this year has been met and that it is critical for this funding gap to be closed. The C.A.R. has been in conflict since a coup in 2013. 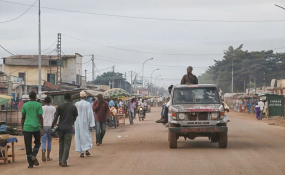 The current government in Bangui signed a peace agreement in 2017 with several of the warring militias in the country, but it has proved ineffective and in recent months violence has flared up again.